Ireland’s Ancient East is the country’s most extraordinary historic and picturesque trail. Beginning in Cork and working its way through some of our most beautiful counties and attractions such as the Viking Triangle in Waterford, the Rock of Cashel in Tipperary, Kilkenny Castle in Kilkenny, Glendalough in Wicklow and all the way up to Carlingford in Co. Louth. It encompasses over 5,000 years of heritage and historic tales and stories and will lead you through an adventure of discovery from castles and monuments to festivals to walking routes and much more. Start your adventure through Ireland’s Ancient East trail in Cork, the ‘real capital’. 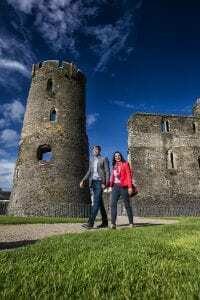 Avail of one of Cork Cities walking tours where you will stroll through the streets and discover the history of the city from Cork City Gaol to the English Market and more. Discover a region with plenty of historical twists and turns! From Viking invaders and Norman knights to high kings, monks and fleeing emigrants.